Here is a super appreciation thanks to Brian Lamb for asking me to do a reprise of Amazing Stories of Openness last presented a year ago at for the CTLT Summer Institute at UBC, part of a panel session called Going Public Into the Great Wide Open. The best part of this day was getting a chance to pick ideas and contacts from the other panel members. I was super excited to find that Tina Loo was there to talk about her experience with the Wiki Educators Program that Brian recently blogged about. For the past two years, a pile of unclaimed HIST 396 term papers has accumulated in the corner of my office, evidence of my failure to engage students adequately. It was as if the energy and anxiety that went into these fifteen- to eighteen-page tomes dissipated completely when they were handed in. The authors of these abandoned papers didn’t, it seems, care how their ideas and arguments resonated with their audience ““ me. Increasingly, it seemed ridiculous to have students spend time doing something they weren’t interested in and for me to spend time doing something they weren’t interested in; namely writing comments. Reading this and hearing more about this has me thinking about the possibilities of getting some UMW faculty interested in this kind of project- they already do incredible research in History, English and Historic Preservation that does go public in UMW blogs, but the elevation of scholarly work in Wikipedia comes across as not just a worthy goal of achievement but a contribution to the world of information. Part of my reason for coming here is to be learning of the successes with their UBC Wiki as a content / community system, which I am still doing, but am finding this idea of Wikipedia research/writing/participation as something we can go far with at UMW. I hope to followup with Tina to learn more about what it took for her to weave the WEP program into her course. The perfect Memo is written to be accessible to a reader of any mainstream newspaper. But a Memo is different from a newspaper article because it develops one academic concept rooted in research in very short form (300 to 350 words), while linking to current events when appropriate. The Memo makes a strong case for an observation/conclusion. That means that phrases such as “my research explains”¦” are not appropriate. Instead, the Memo should offer the explanation or an element of the explanation referred to here. Phylo is a project that began as a reaction to the following nugget of information: Kids know more about Pokemon creatures than they do about real creatures*. We think there’s something wrong with that. 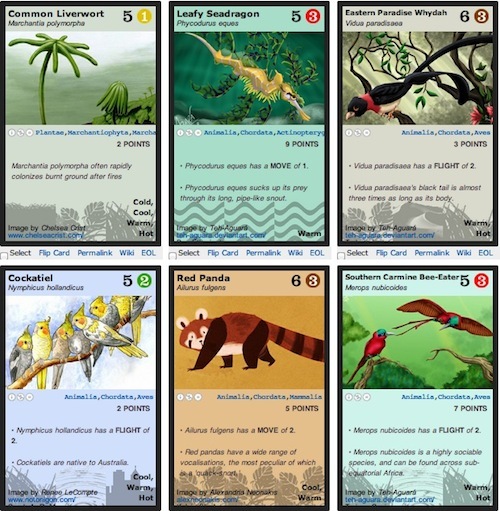 Ng’s group has developed a web-based trading card game built around the natural world- the cards are lavishly illustrated (art work is solicited via a flickr group) but also full of facts and a game paramaters that come into play as a game that is played off the computer. But the thing I had missed before is that they offer the site as a WordPress template (hmm, link in the site footer is not working, but I will follow up with David next week), and I am filing this one away to think about as what other sorts of content could be put into this game engine. These are unexpected things that are the serendipity engine of the web, that happen as an unintended result of sharing your stuff freely. Now while I cannot guarantee that if you share openly, you will get an invitation to travel to Australia or have your photos appear in a book, etc. But I can guarantee that if you DON’t share, that you will never be a benefactor of an amazing story. And I have yet to come across a person who has an amazing story because they locked their IP inside a box. 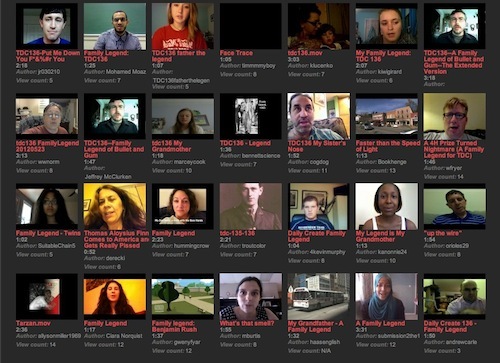 Again, this ability to get to see people in this community talk from their home about a family story is what makes ds106 more than just some content shoving MOOC, this ds106 place has a heartbeat, a soul, something blatantly lacking in You Da City.